The Republican-led Senate has the power to ratify the test ban treaty. It can finish a journey started by one of their own, President Dwight D. Eisenhower, who believed that ending testing was a step toward global disarmament. Ike did not want Americans to have carry the expensive burden of nukes forever. Read the letter at the New York Times. 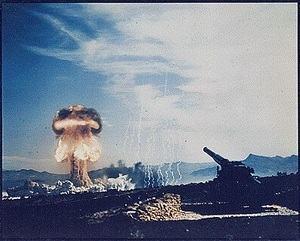 A new petition at CARE2 calls on the Senate to ratify the Comprehensive Nuclear Test Ban Treaty (CTBT). The treaty bans all nuclear weapons test explosions. The Senate has to ratify the treaty for the U.S to join. Nine countries, including the United States, still need to ratify the treaty for it to enter into force. The other eight countries include China, Egypt, India, Indonesia, Iran, Israel, North Korea and Pakistan. Russia has already ratified the CTBT. We the undersigned ask you to ratify the Comprehensive Nuclear Test Ban Treaty (CTBT). A global ban of nuclear test explosions benefits U.S. national security. The CTBT is a step toward nuclear disarmament. The treaty is a step away from a costly arms race which new nuclear test explosions would certainly invoke. Nuclear weapons spending drains our society of resources better spent on domestic and international priorities. Ratification of the CTBT will be vital for moving forward on further agreements related to worldwide nuclear disarmament. Our Stockpile Stewardship Program can maintain our current nuclear arsenal. The CTBT international monitoring system will ensure there is compliance with the treaty globally. The threat of nuclear war, nuclear terrorism and the massive cost of nuclear arsenals make the CTBT very much in our interest. We ask that you support ratification of the Comprehensive Nuclear Test Ban Treaty (CTBT). Thank you for reading this petition.